Well, if you have a little one at home who is used to getting almost all of your attention, then it’s going to important that you take steps now to prepare your child for their new sibling’s arrival. Because, let’s face it, even with the very best of intentions, there will naturally be less time for you to focus on your other children in the initial weeks and months after the new baby comes along. Even with lots of help from your partner, your parents, friends and other family members, your new baby needs you. And there’s no denying it – you’re going to be torn in many different directions once the new baby is here. Talking to your child and encouraging them to get excited about your new baby from early on in the pregnancy is a great idea. Give them as much time as possible to get used to the idea of there soon being a new person joining the household. You could show them the scan pictures you have taken at 12 and at 20 weeks. Or better still, even take them along to the scanning and midwife appointments so that they can feel part of the process and hear the baby’s heartbeat. When looking at the scan pictures, point out the baby’s head, body, arms and legs. Make them aware that there really is a real, live baby inside their mummy’s tummy – of course, it’s hard for children, especially young children, to imagine this. You can even involve them in the decisions you’ll be making during your pregnancy about what baby clothes or toys to buy as well as things like how to decorate their nursery. The main concern your child may have is that they will no longer be as important to you as they are right now. Which is a completely natural fear and very typical response to a situation like this. Of course, no-one wants to feel pushed out. So, ensure that you provide lots of cuddles and reassurance that nothing will change about their relationship with you. I’d suggest that you continue to make plenty of time for your child both during the pregnancy and after the new baby is born. While they’ve been young, you’ve no doubt started routines that include one-on-one time with them. Maintain those routines that they have come to know and love – the bedtime stories or the weekend trip to the park or swimming baths. This will all help them to feel secure and loved, and to feel involved, even after the arrival of the baby. And, also allow them plenty of time to ask questions about the new baby, (yes, perhaps even how the baby got into your tummy! ), and answer them as best you can, to eliminate any queries or concerns they may have. Excite your child about the new baby’s arrival by talking about all the good things that will come of them having a new brother or a sister – both immediately, and longer term. Most children will love the idea of having a playmate, for example. Talk about all the fun that they will have together as they grow up side by side. Talking about what life will be like once their new sibling has been born is a great way for them to start imagining the new baby being around. If your child see’s the new baby getting lots of gifts and cards when they are born, and they get nothing, they may get upset. So, prepare for this advance. Buy him/her a gift or two (it needn’t be expensive) or ask the family to bring along gifts for both children so that this doesn’t escalate into a problem. You could even tell them that they are gifts from their new brother/sister, just to help things get off on the right foot! 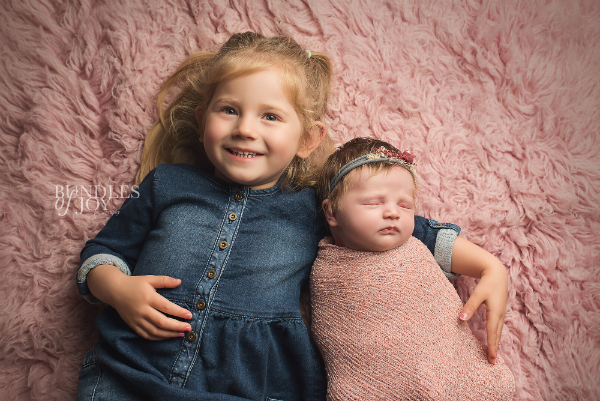 Finally, since you’re probably looking to book a newborn photoshoot so that you can preserve the magical first weeks of your new baby’s life in photos, remember to involve your other child or children in that. 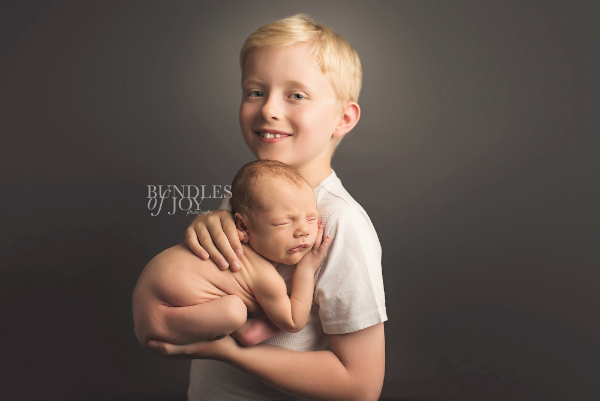 Here at Bundles of Joy Photography, we love involving siblings in newborn photoshoots. So, if you’d like us to, we can take photos of your children together, like the ones I’m sharing here. They’ll be able to look back on these beautiful pictures in years to come. 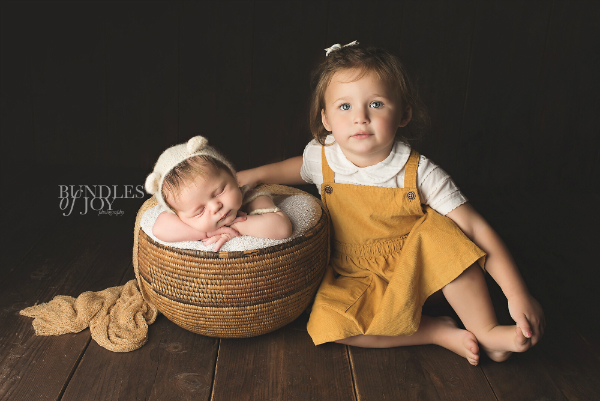 Making them feel involved in their new sibling’s photoshoot will be a great way of encouraging a strong relationship between them from the start. So, I hope these tips have been useful? If you have any further tips on how to prepare your child for their new sibling’s arrival, please share them in the comments below.